Once the eggnog reaches 150 degrees, switch Instant Pot to “keep warm” setting. Continue mixing frequently until the eggnog reaches 160 degrees. Then transfer to an airtight container and chill overnight. 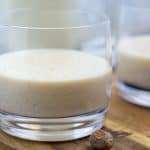 If you prefer a boozy eggnog, add 1 cup of bourbon and mix well just before chilling overnight. DO NOT heat the alcohol up or it will lose all its goodness!